I know, I know...there are so many children's Bible story books to choose from! It's hard to know which is worth your time and is going to be a good fit for your family. We have a nice little collection of our own going, but the one that we have been most excited about of late is a new release by Crossway Books, by Starr Meade. It's called Mighty Acts of God and is exceptionally well done. I am a huge fan of this one for multiple reasons. Remember, I'm writing from the perspective of parenting a 3 1/2 year old and who has started to really start asking questions about the world around him. He is in prime "Tell Me Everything About That Which I Do Not Know" mode and I feel like Mighty Acts of God was written just for him. My son is a lover of all things that live in the ocean and if I would let him, the only story we would be reading (and that one over and over again!) from this book would be Jonah and the Whale. However, it is laid out in "chapters" (which are numbered and are all of 2 page spreads in length - max.) I told him we would have to read TO Jonah and the Whale and not just about Jonah. I also told him that this book was a chapter book and that made it super cool to read in sequence! When we cracked open Mighty Acts of God we began at the beginning, in Genesis. "When we made chocolate chip cookies, who do they belong to? Well, they belong to us, right? They are ours. We made them. God made Adam and Eve. They belonged to Him. But they were disobedient. When God first made the earth, it was perfect, beautiful and fun! You could swim with sharks and not get hurt! But after Adam and Eve disobeyed God, they had to suffer the consequences of their disobedience. No longer can man swim with sharks without becoming hurt. God was very sad about Adam and Eve's choice. But! He provided a way for them to enter back into fellowship with Him. He LOVED them and so He sent His son Jesus to come." More or less, that's how we connected the dots from the beginning to the cross. This book made sense to Bookworm1 and therefore I am a huge fan of it. There are some aspects of it that we don't quite comprehend just yet but that's ok. It's a start and I think it's quite an amazing and useful tool for introducing children to the Gospel message in particular. Really, that's what it is. It ties the entire Gospel message together in each story so that individual stories and descriptions do not feel so disconnected. 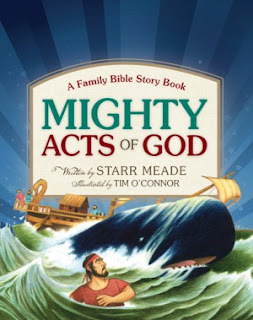 Starr Meade has done a beautiful job of weaving together stories to make the Bible's history clearer to young readers. Thanks, Crossway Books, for your generosity! Because this is a book that we consistently read aloud, I'm linking this book up to this week's Read Aloud Thursday post which is faithfully hosted by Hope is in the Word. This post was originally posted as a giveaway but the contest is now closed. We have four daughters I look forward to reading this with. My 3 1/2 year old is at the same stage! This looks great! Our twin girl toddlers will love this for their birthday next week! Very interested in this one for my Sunday school classroom! WhooHoo! Sounds like a great book! Thank you for another great family resource! I've heard of Starr meade. I'm sure this is a good one! Pleas enter me. I would love to read this to my kids! we posted about it at Winning Readings. Oh man, I have 3 kids at this stage and we'd love this. This sounds like a great way to bring the bible stories to children. My little guy loves books -- and this one sounds great! This sounds great and would be a wonderful addition to our Bible storytime. I have a 3 1/2 year old too, and this looks good! Please sign me up! This sounds like a wonderful book! Please count me in. I am always looking for good ways to share THE STORY with my kids! Thanks for telling us about this one and for the giveaway.